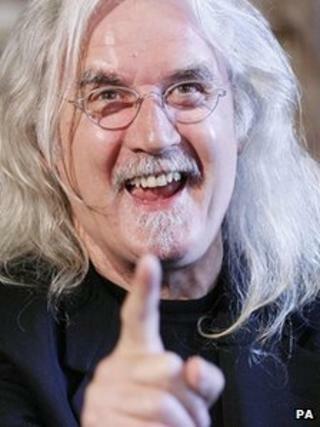 Comedian Billy Connolly will play a dwarf warrior in Peter Jackson's Hobbit films, the director has announced. "We could not think of a more fitting actor to play Dain Ironfoot, the staunchest and toughest of the dwarves, than... the Big Yin himself," he said. "With Billy stepping into this role the cast of The Hobbit is now complete." Brit Martin Freeman will play the central role of Bilbo Baggins in the Lord of the Rings prequels, currently shooting in New Zealand. Barry Humphries, Stephen Fry, James Nesbitt and Evangeline Lilly are among other new additions to a cast that includes Rings regulars Sir Ian McKellen and Cate Blanchett. Glaswegian Connolly has an extensive list of screen credits that includes roles in Mrs Brown - for which he was Bafta-nominated, The Last Samurai and Gulliver's Travels. The 69-year-old is currently in the middle of a 42-date UK stand-up tour that will see him perform at the Royal Concert Hall in Nottingham this weekend. The Hobbit: An Unexpected Journey will be released this December, with a second movie, The Hobbit: There and Back Again, to follow 12 months later.